INGREDIENTS: Psylllium Seed, Fennel Seed, Cascara Sagrada Bark, Buckthorn Bark, Licorice Root, Rhubarb Root, Ginger Root, Golden Seal Herb. OTHER INGREDIENTS: GUM ACACIA, MICROCRYSTALINE CELLULOSE, SILICON DIOXIDE, STEARIC ACID, MAGNESIUM STEARATE, CROSCARMELLOSE SODIUM, COATING (SODIUM CARBOXYMETHYCELLULOSE). CONTAINS NO YEAST, SOY SUGARS, STARCH, COLORINGS, DYES OR FLAVORINGS. 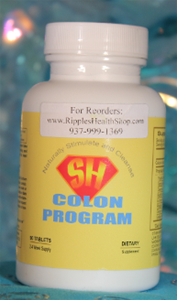 The Whole Body and Colon Formula are designed to eliminate impurities over a 3 month period. What the Program Does: The Colon Program cleanses your colon and intestines. The Whole Body Program helps to cleanse the body. Ideally you should have 1 elimination (bowel movement) per meal. Constipation is defined as: Less than 1 elimination per meal eaten. Experiment with the tablets and see how many you need to achieve this goal. Do not overdue it, be patient, the process takes 3 months. Intensive, Deep Inner Cleansing Intensive Deep cleansing is an individual thing. Through experimentation, you will establish how many of each tablet formula you will need. Relax, there is no way to speed up the process. Drink plenty of water, 80 ounces, or more, a day. Follow Up Maintenance of Your Cleanse After you FINISH your intensive 3 months of cleansing, wait 3 weeks & then use both products again for 1 week. By maintaining this routine of 3 weeks off and 1 week on, you will maintain the benefits of your intensive 3 month cleanse, for up to two years.